NOW UPDATED to reflect new information and examples of Instagram posts! The problem is that many business owners are still unsure about how to harness this game-changing social media platform to the fullest, particularly because it is an image-heavy site. 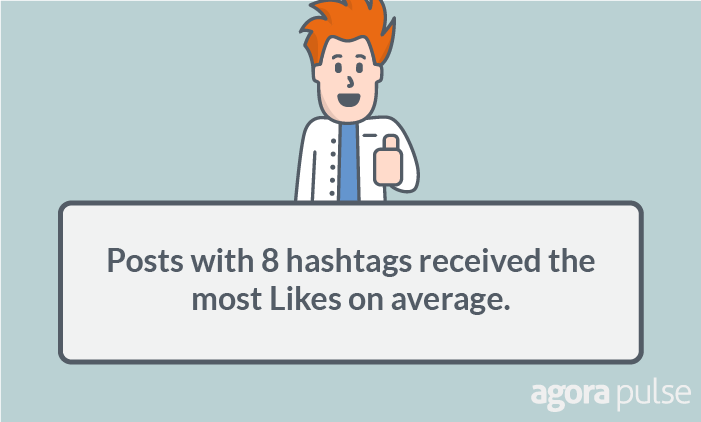 Mistakes in posting are a common phenomenon that could be costing you those all-important engagement rates you’re working so hard to improve. That said, businesses could get a handle on these mistakes by taking corrective measures beforehand — and making sure they’re only posting top-notch, error-free content to the platform. So, what are these corrective measures? I’ll walk you through 18 common Instagram mistakes made by businesses and the steps you need to take to avoid them in the first place. Traffic is the lifeline of all businesses, be it online or offline. You can’t expect to make sales if there’s nobody available to sell to, right? Instagram might be the indispensable arrow in your social media marketing quiver that could drive traffic to your online business in big numbers (at least this year with the kind of likes and engagement it receives). But for the traffic to show up on your website, you need to first focus on adding a link or call-to-action in your bio – a small element that many businesses don’t consider worth their time and attention, especially with the need for high-quality photos and engaging captions in every post you’re publishing. Solution: Include a CTA or link in your Instagram bio by heading to Edit Profile > Link. 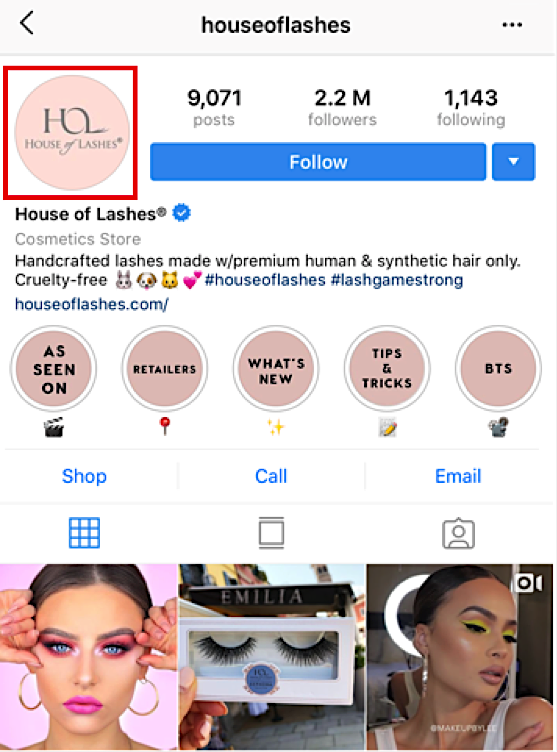 That makes it crucial for brands to always include a link in their Instagram bio—whether that’s to your website, landing page, product page or even social profile link. But don’t feel like you need to pick just one. Multiple call to actions can increase conversions by as much as 20%, and tools like Linktree allow you to link to multiple URLs directly from your Instagram bio to cater to people who are looking for specific things. This is especially relevant if you’re using your Instagram captions to direct people there in the first place. Adding your brand’s picture is crucial if you really want users to follow your Instagram account. Why? Because a missing profile picture is the perfect symbol of lackadaisical attitude. It plainly means you are not very keen on growing your user base. Forget about attracting new users; you’ll lose out on the existing ones if you keep your profile picture blank because that ghost-like blank photo will keep appearing every time you make a comment. Solution: Make sure you upload your brand’s profile picture by heading to Edit Profile > Change Profile Photo. Whether you’re adding a company logo or a photo of your CEO, remember that your profile picture on Instagram helps to consistently build your brand across various platforms. That’s especially important because on average, revenue increases by about 23% with consistent brand presentation. 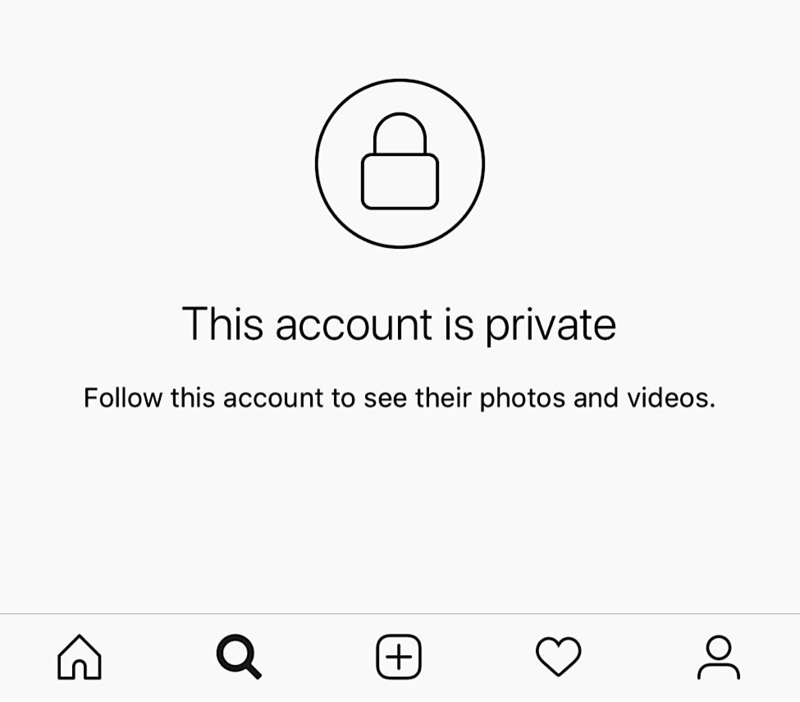 If you’re really interested in gaining followers on Instagram, I don’t see any merit in keeping your account in private mode, because it drives away your potential followers. If you keep your business account in private mode, the wannabe followers need to send in a follower request first. And since brands need to accept these requests manually, it might take some time for new followers to begin viewing both your new and old content. That’s a huge inconvenience. In a way, these new followers would be absolutely clueless about the kind of content or messages that your business is sharing because they can’t view it beforehand, which could lead to fluctuating follower counts if people are accepted and then discover that they dislike the content you’re posting. Twitter may be the Godfather of hashtags, but Instagram is equally inundated with them. While it’s important to consider how many hashtags you’re using, the phrases you’ve selected also play a huge role in the post’s success. So if you’re thinking about manipulating users or Instagram’s algorithm by using a million irrelevant hashtags, think again! Solution: Add a minimum of 5 hashtags to each Instagram post, and stick to relevant words and phrases. 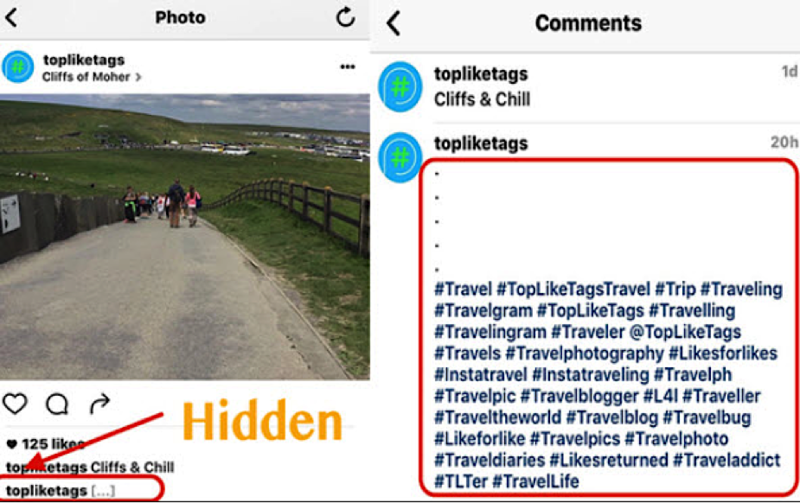 Top tip: Add hashtags in a comment beneath your post, rather than in the caption. 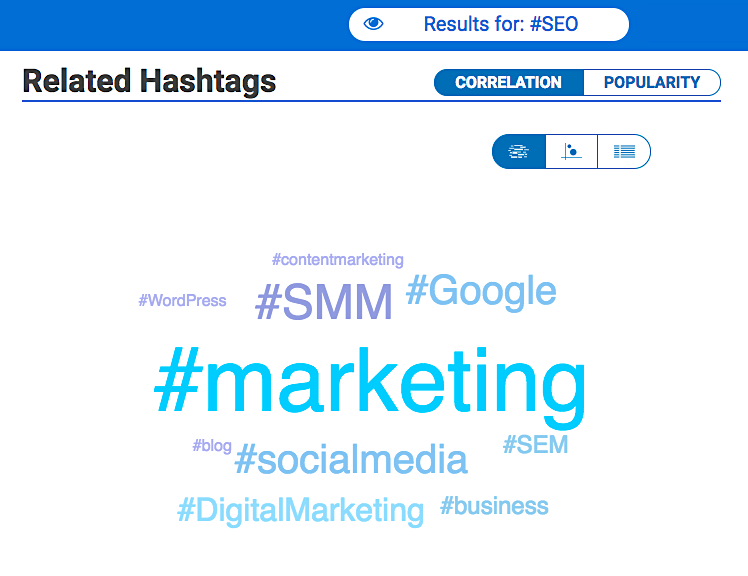 This makes your captions easier to read, while still taking advantage of the hashtag search benefits. Saturating your Instagram account with too many duplicate photos and videos will do a great job at driving away your followers. If you’re not sharing anything new, fresh or exciting (and clogging your followers’ feed with the same photo over and over again), why should they bother following you? 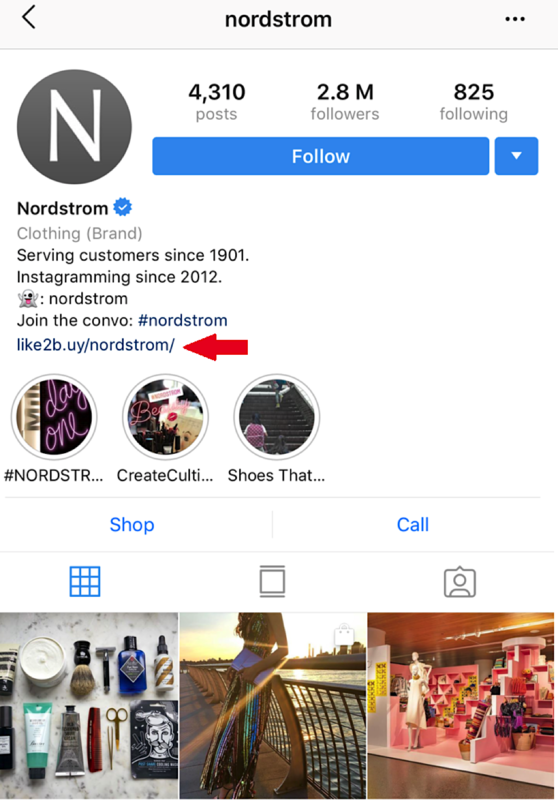 Instagram users love to shop (particularly now that they don’t need to leave a brand’s Stories), so you need to display as many different images as possible, including new ones. But if older images are all that you have and you keep re-posting them, you might not only disappoint your existing customers, but Google as well. Solution: Instagram users are looking for entertainment and the best way to entertain them, and keep your profile high on a user’s favorite account list, is by posting new images — not regurgitated ones. And, more importantly, use your own photos, not stock photos. You could even use memes and quotes, or change colors and fonts, but whatever you’re posting, the bottom line is to figure out what kind of content resonates with your audience. You’ll run the risk of clogging a user’s feed. When they scroll through a feed that’s dominated by your brand, they’re likely to unfollow your profile so they’re able to view other people’s (better) content. Solution: Space out your content by using Hootsuite or Buffer’s Instagram integration. 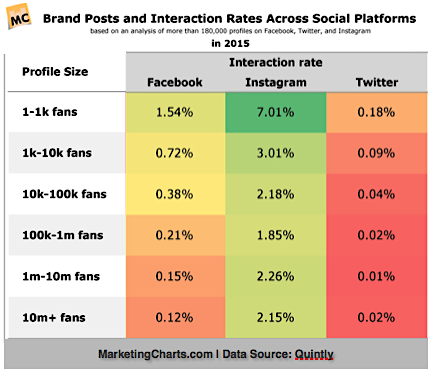 This gives your followers some time to interact and engage with your brand. Images are at the heart of Instagram. Needless to say, you need to post top-quality, high-resolution images if you want to stand out and make an impact with your content. The better the resolution, the better the opportunity for sales. Make your images 1280 x 1280 to ensure that they look great when they get compressed. Record videos in 600 x 315 (minimum). Snap photos in indirect natural daylight or during golden hours (the 30 minutes or so right after sunrise or before sunset) for the best-looking images. Try using an image-editing app like Afterlight or Snapseed to make your images look unique, arty and professional. For instance, Pinecone Camp highlights the sublime decor of their products with great-looking photos. If your Instagram profile looks like a high school scrapbook, it could be because your images lack unity in them. 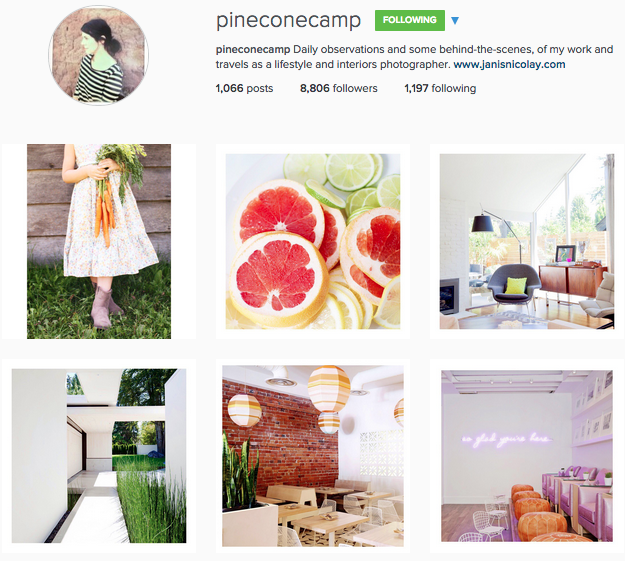 Considering that those top nine photos gives a user their first impression, a lack of cohesiveness in the content you’re posting could cause them to head back — without nudging the “Follow” button. Notice how each photo fits together and makes the profile feel consistent? I’ll bet you’re more likely to follow them than another brand whose content is all over the place. Solution: Follow The Sunday Chapter’s guide for some excellent tips on creating a cohesive look for your images. Over 24 billion selfies were taken in a single year, according to Google — but unless you’re a celebrity or an Instafamous account known for your looks, it might be wise to steer clear from filling your brand’s feed with selfies. While the odd selfie can help you to tell a story and build personal connections with your audience, remember that successful content strategies focus on your audience — not the brand. It’s pretty hard to fall into that category if you’re constantly posting selfies. Solution: Don’t go overboard with selfies, but make sure you’re adding a relevant story to each selfie you do post. There isn’t a single best time to post on Instagram; it differs from company to company, and industry to industry. For example, students are more likely to spend time browsing the platform late at night, whereas busy professionals might only use the app on their commute to or from work. Needless to say, the timing in which you’re posting your content is important. You can’t expect to get tons of engagement on your posts if nobody is around to see it. To engage better with your audience and encourage them to comment on your posts, your Instagram captions and photos need to align. In other words, the copy should support the image. So rather than simply post a photo, make sure that you add several relevant paragraphs to the post. Notice how that caption encourages you to comment on GoPro’s post with your own story — more so than a typical (and boring) “Happy Friday” type of caption would. Keep in mind that you’re allowed to add 2,200 characters to every post, but make sure to give each word power. Nobody likes fluff. Solution: Include only relevant and important text to your images and try asking a question instead of simply making short statements to engage your audience. As long as your question is simple and interesting, you can expect to receive answers/comments. Good Question: = Would you buy blue or black? Poor Question: = What do you think? 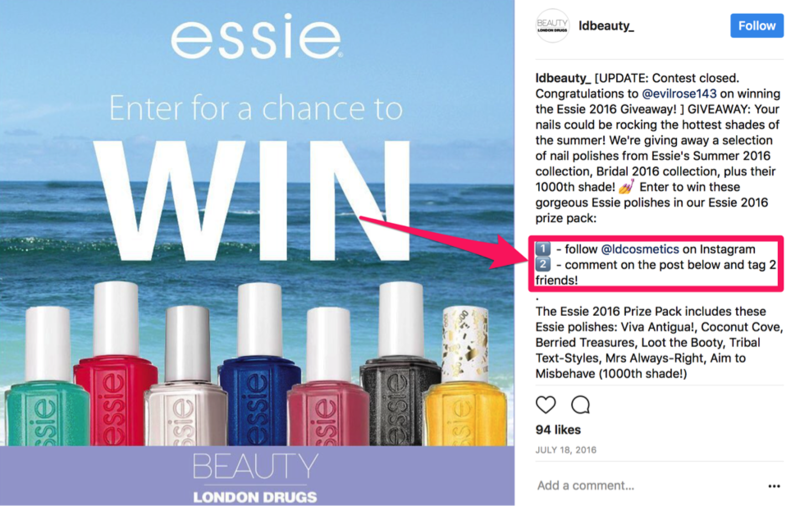 Some businesses, knowingly or unknowingly, avoid calls to action (CTAs) in their Instagram captions. But if you want to get on-site results — such as conversions or website traffic — you’ll need to flat-out tell your followers what they need to do. CTAs have been proven to help businesses see a 158% uplift in click-through rate (CTR) when used in email, so imagine the power CTAs have when they’re placed in your Instagram caption — and viewed by highly engaged followers who are eager to view your new content! Solution: Include calls-to-action! For example, if you want your fans to buy or subscribe to something, then tell them plainly to GO FOR IT or SIGN UP. A geo-location tag in your post can increase user engagement by as much as 79%. Why? 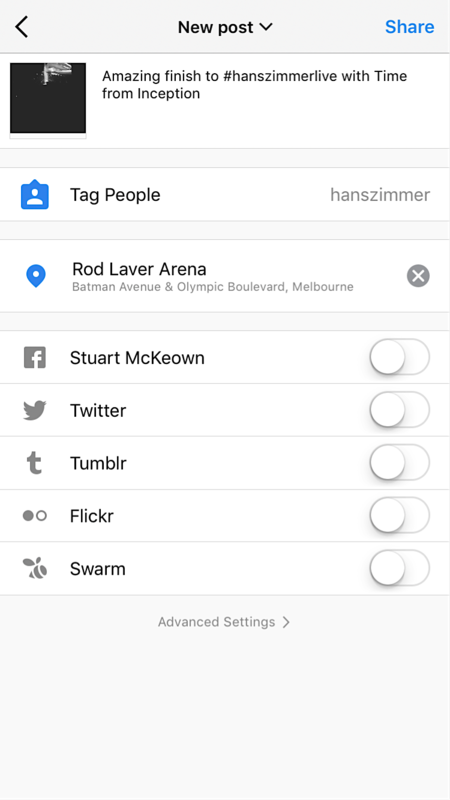 Because adding these tags helps followers track down your location, which is ideal for businesses who have brick-and-mortar stores or who organize events around the city or country. Adding a geo-location to your restaurant, retail store or office will help to engage local users. Some people follow others in the hope of getting a follow back, but such follow-backs are rare. It’s tough to convince someone to follow your page unless you’ve got a great feed and attempting a “follow for follow” technique looks fishy. So if you are following 1,000 people but have just 200 followers, that speaks volumes about your brand. People might question how trustworthy you are and whether you’re only using the social media site to spam. Rather, it should be the other way around. Having more followers simply means that you are coming up with good posts and that Instagrammers are interested in your content. Solution: If you’re following way more people than you are being followed, don’t be shy about unfollowing some accounts to bring your ratio more into proportion. A good way to get new followers within your target demographic is by heading over to your competitors’ Instagram accounts. 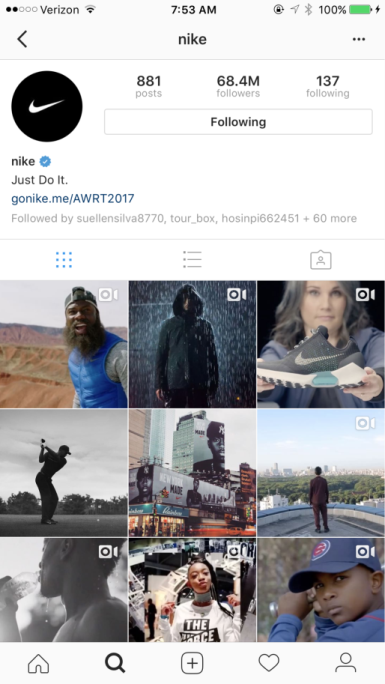 Let the other brands build their following (and do the hard work by posting engaging content in the first place) and then simply go in and interact with their audience. Why is this a good Instagram tactic? Because the people who are following your competition clearly already have an interest in the product or service that you are providing. 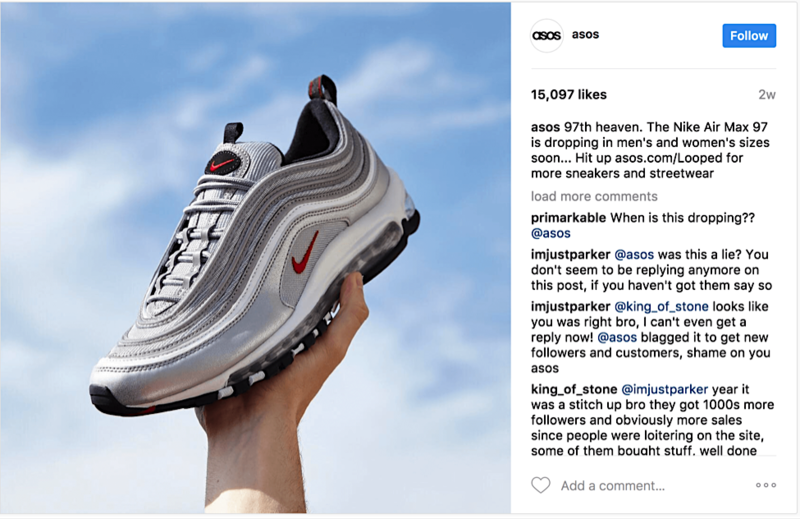 If you’re able to sneak in there and comment on the brand’s post—whether that’s by answering another person’s question or liking their comments—you’re placing yourself on your target customers’ radar. Who’s to say they wouldn’t click through and give your page a follow? Solution: Find top competitors in your niche and respond to comments left by their audience on recent posts. This means engaging in a way that won’t get you a restraining order! Initially, getting a follow-back will be few and far between, but as you build up your brand’s reputation, the pace will pick up in no time. 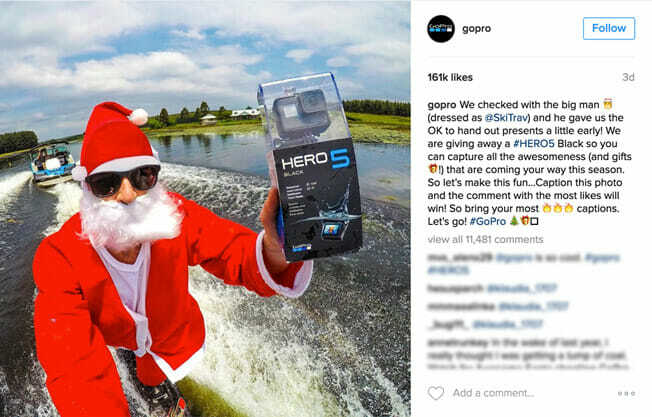 It goes without saying that Instagram contests are one of the best ways to boost engagement and get new users. And, considering that 80% of users follow a brand on Instagram, running a fun contest could be the perfect way to get your potential customers engaged. That said, you need to have a decent number of followers before you implement a contest. Running a contest that gets you no likes or followers is not a goal worth pursuing—and it’s almost impossible to get a decent number of contestants if you haven’t got an audience to push it to. 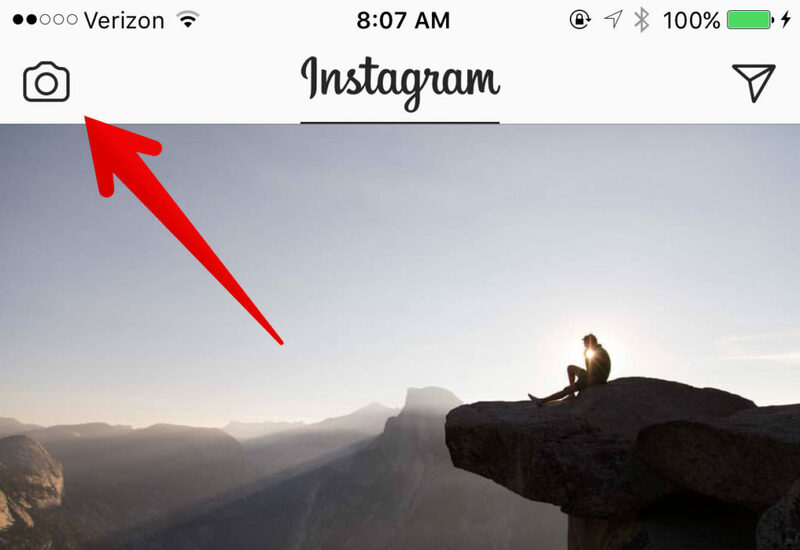 You’ve got just 15 seconds to grab an Instagram user’s attention. So if you’re planning to broadcast a live video, it’s important to alert them to the broadcast time early on, or else you’ll have no viewers for your video. Solution: According to Neil Patel, you should aim to post one live video per day at the same time each day. The reason it’s so important to broadcast at the same time each day is so that people know when to find you and tune in to your video. Random broadcasting won’t get you followers because people won’t know when to expect your content to be shown. To start broadcasting live, just tap the camera icon in the top left corner and then swipe left to go live. Post an image with the upcoming broadcast time. Post a story every day with the upcoming broadcast time. Remember: the average person watches 1.5 hours of video content every day, and 81% have been convinced to buy a product or service after watching a brand’s video. Use that to your advantage! The one and only reason you opened an Instagram account in the first place was to establish a stronger bond with your brand followers, right? But you can’t stop there. You need be involved in all related activities, including replying to all comments if you want to see success from the platform. If you aren’t doing that, you’re defeating the very purpose of setting up an Instagram account. Not replying to comments comes across as not valuing the user connection. That’s a good way to get people to unfollow you. Solution: To prevent such unfollows, make sure that you tag your reply with the commenter’s Instagram handle (@tag) in all replies. This ensures that they get a notification – which might inspire them to respond and engage further. Instagram is the ideal place for growing your fan base. But just like any other marketing campaign, you can’t expect instant results. Keep coming up with valuable posts on a continuous basis, be an active member and, more importantly, follow the do’s and don’ts of good Instagram etiquette get great results. 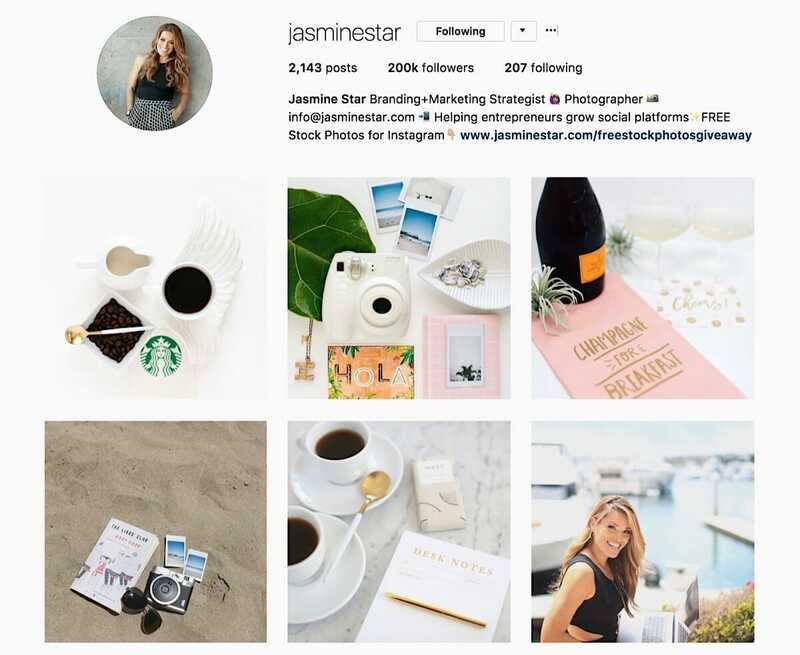 You’ll soon see a change in your engagement rates (and possibly conversion rates) if you’re avoiding these Instagram mistakes!